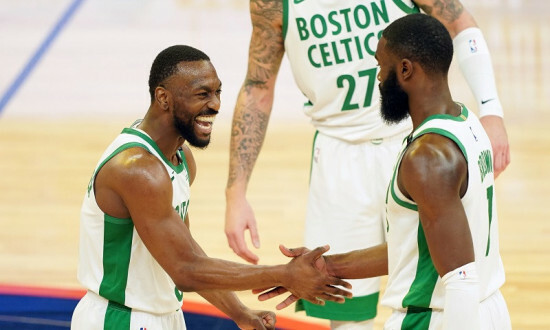 Tuesday’s four-game slate was an interesting mix of high-priced studs and reasonable value plays that had pretty much all of us looking down the same path. I didn’t do very well and pretty much quit watching halfway through the evening, but I am thinking that diving a little deeper into my process is going to reveal a few mistakes that I should have seen coming…or we will find out that everyone had a rough night and I should just forget about it and move on to the next one. 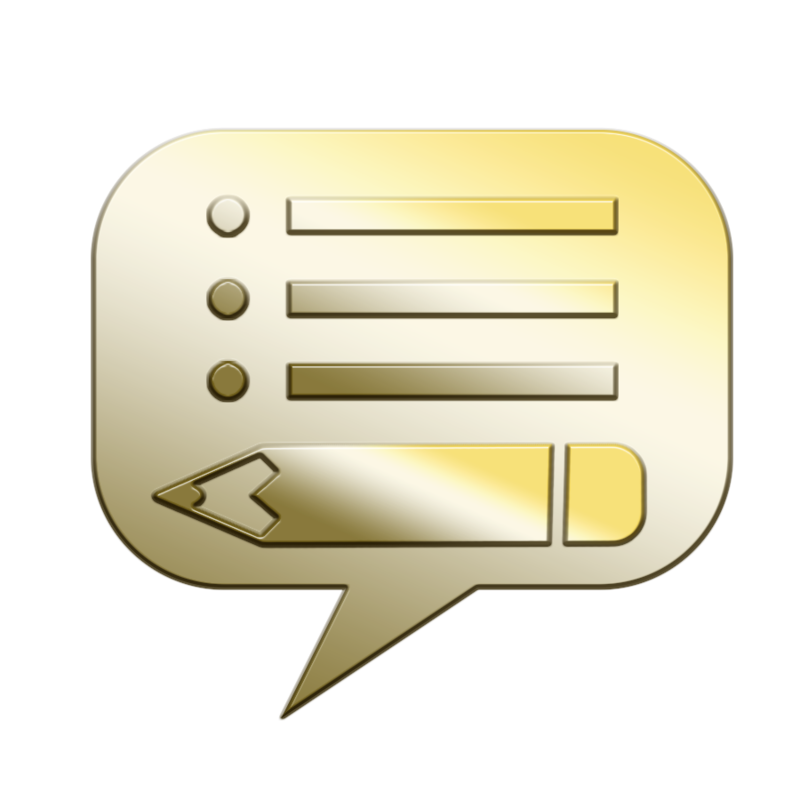 Editor’s Note: Monkey Knife Fight is a unique take on daily fantasy that pits players against the house (rather than other players) in a series of prop bets from games across the NFL, NBA, NHL, and eSports leagues. There are no lineups to build or salaries to manage. Simply pick a game, look at the available props, make your decision, and choose a bet amount. 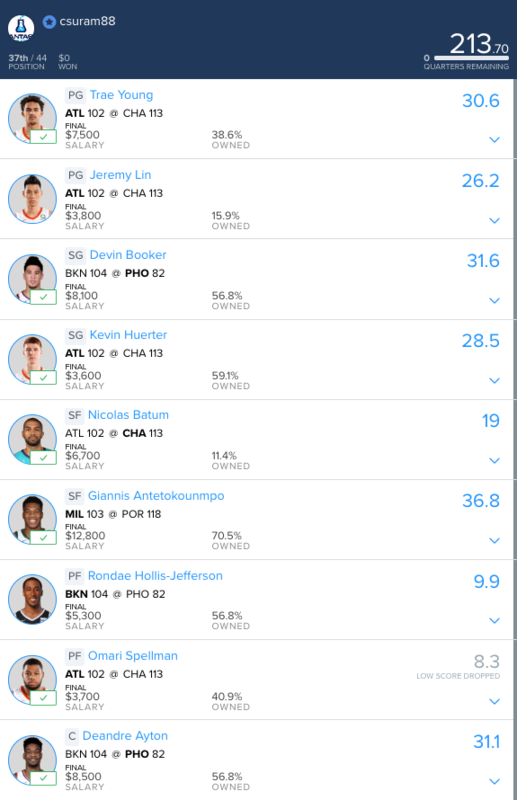 Based on the fact that there weren’t a whole lot of options on this small Tuesday night slate, I decided that the best place to start would be to lock in the three guys that I expected to be the highest raw points scores of the night. 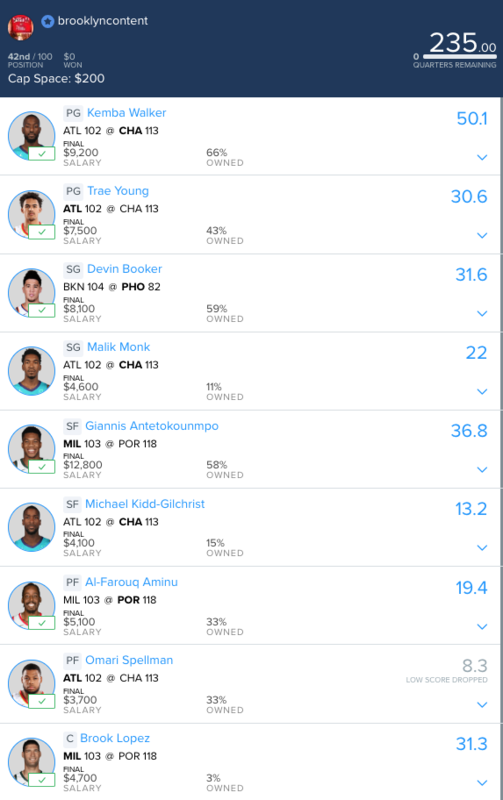 So with that, I was all in on Kemba Walker, Devin Booker, and Giannis Antetokounmpo despite feeling like each of them was a bit overpriced. Malik Monk just barely saved his evening late in the fourth quarter, but guys like MKG and Spellman were a trap that I should have seen coming a mile away. Meanwhile I have Marvin Williams circled in my notebook and didn’t pull the trigger on him. 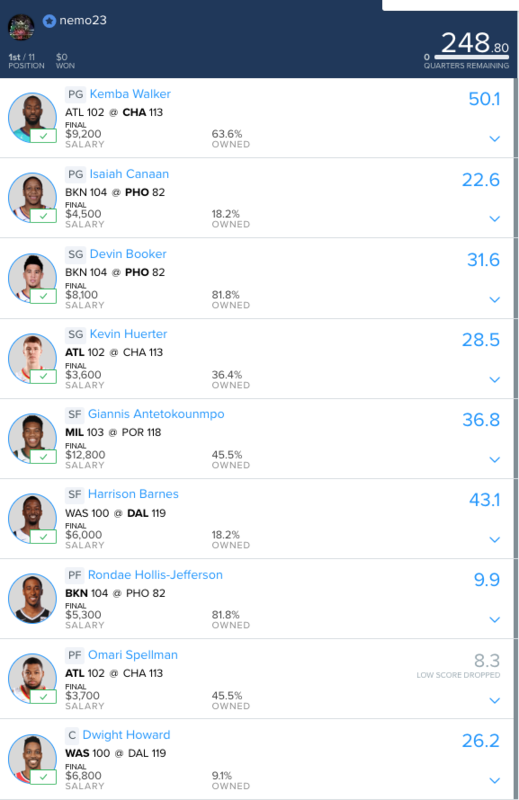 I didn’t recognize any of the names in the top nine cashing spots of the $535 Rainmaker Single Entry Tournament, but Awesemo was sitting in 16th place with this lineup that started with my three raw points guys and added DeAndre Jordan to that mix. Then he filled in with cheap guys a different way using Tony Parker, Kevin Huerter, Evan Turner, Rondae Hollis-Jefferson, and Omari Spellman. 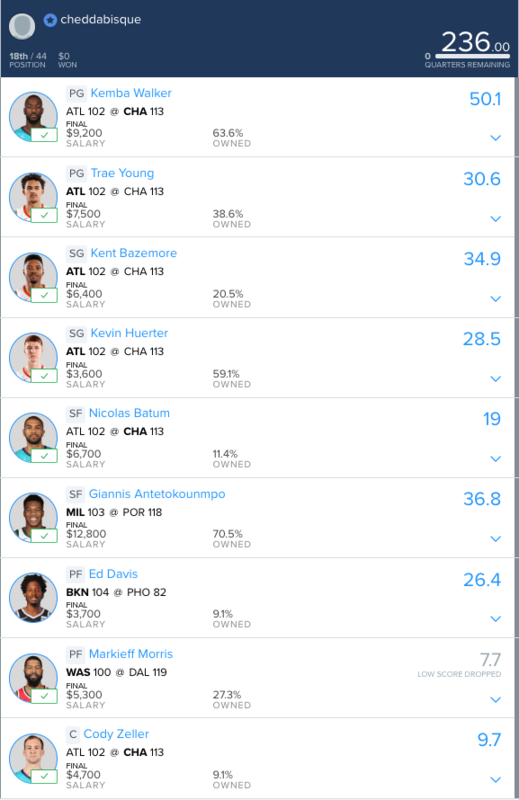 Right behind Awesemo was BigPapaGates with this lineup that faded Devin Booker and Giannis Antetokounmpo in favor of spreading that salary around to guys like Trae Young, Kent Bazemore, Nicolas Batum, and Deandre Ayton. In addition to only getting 19 from Batum, he also had duds from MLG, Aminu, and Spellman. CheddaBisque was right in that same area with this lineup that was back on Giannis but still faded Booker. He actually got a nice game from Ed Davis, but rough ones from Nicolas Batum, Markieff Morris, and Cody Zeller were pretty much impossible to overcome. 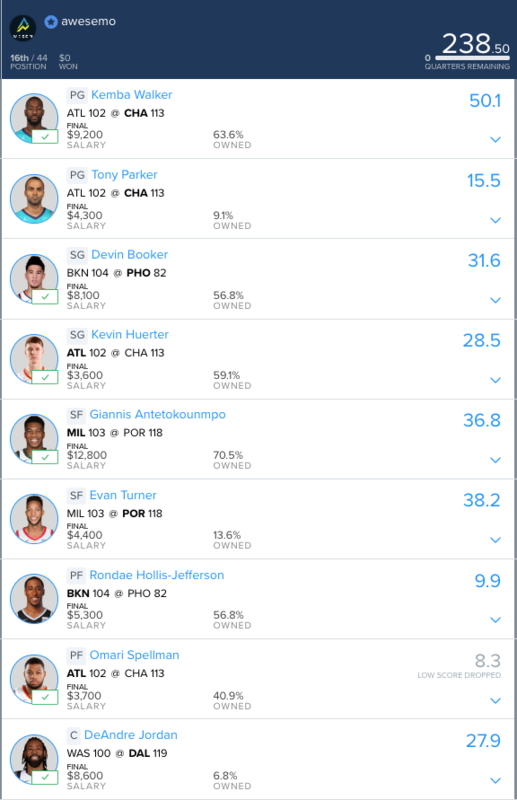 Our old friend CSURAM88 also had a rough night as he was in on Devin Booker and Giannis Antetokounmpo but faded Kemba Walker. It was dud-city pretty much across the board for Pete, and after looking at his lineup I am not feeling all that bad about mine at all. Things didn’t go well for me last night, but since most of the professionals we checked in on did about the same or even worse, I’m actually not feeling too bad about my process. I knew that I was taking on a big risk with those Atlanta guys, and if it had paid off I would have been talking up my process. So with that, everything is fine. Let’s roll onto the big Wednesday night slate where we have ten games on tap. Get to work on that research and I’ll see you back here tomorrow morning for another edition of Fading the Chalk. How do we enter your tournament? Thanks buddy! Love the mention. No offense taken at all. It’s like an easter egg….you gotta be an insider to get it. Not gonna just spell it out for you, playa. HAH! It’s all love, my brother! Just DM my on the Twitter and I’ll get you an invite. Draftkings player here, won in both double ups, luckily, cause Booker and bembry burned me, but made it by by fading Giannis and getting the rest right. Big thanks though, reading this article has taught me a bunch over the couple years playing. Sometimes you have to go against the odds and pick player me in difficult matchups but Greek Freak and Booker were easy fades for me. The nets defend SG well and the trailblazers defend the SF and PF positions well and their pace isn’t that fast. The Auto play was John Wall.